Outdoor path lighting is more than a decorative landscape element. For seniors with limited eyesight, it’s also a useful way to prevent falls. These accidents cause over 27,000 fatalities each year in adults over 65. Luckily, you’ll find numerous options that can serve both decorative and sight purposes well. Though a bit more expensive, these lights are well-made and built to last. They have a range of voltages between 12 and 24V. You can rotate them to the best position for optimal illumination. They come with a 24-month warranty. It’s expensive if you have a large area to cover. You have to buy the low voltage wires separately. 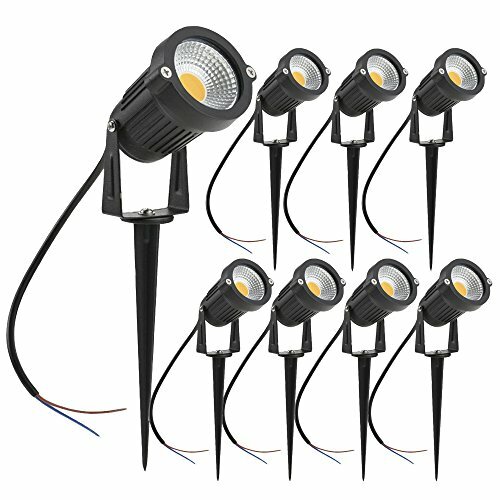 The ZUCKEO 5W LED Landscape Lights are a well-constructed set that offers plenty of options for adjustments and providing the optimal illumination for your specific needs. The ability to adjust these lights also adds to their versatility in where they can be placed and how you use them. You can angle them downward and use them to shine a light on your pathways, or you can angle them upwards toward walls to illuminate signs or things like street signs and house numbers. This is especially helpful for seniors who may have trouble seeing at night and need extra assistance in finding their driveway. They are LED and are quite bright considering that they are only 5 watts. They are made of aluminum, which makes them lightweight and able to handle the elements well. The aluminum ensures that these lights are both water resistant and rust-proof, so they’re built to last in both rainy and snowy climates. The quality is evident throughout the construction from the glass lens to the design. Many comparable products have plastic parts that are prone to wear, but this one is metal. It’s a worthwhile purchase which delivers more than it promises. These solar lights operate efficiently and provide 360 degrees of light. The light is 360 degrees with the cylinder-shaped covers. They have a built-in night sensor to turn them off and on as needed. They are wireless, thereby, eliminating a fall risk. While the stakes are durable enough, the light cover is not. Won’t work all the time, especially during cloudy seasons. 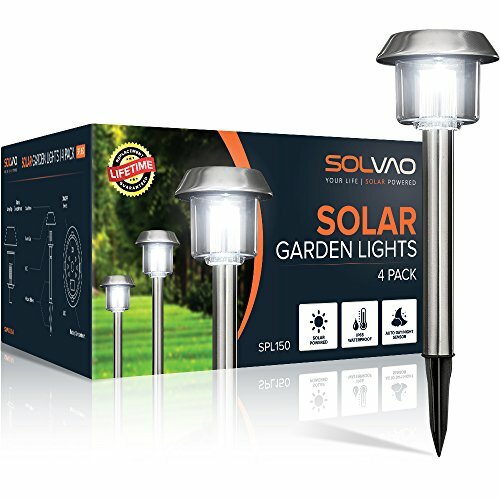 The SOLVAO Solar Path Lights offer an affordable way to add some welcome illumination to your walkway or garden. The brightness is soft and not glaring, though it is a cool white instead of a warm glow. The lights are built to handle the elements well so that you can leave them outdoors year-round. They take up to eight hours to charge and provide an equal amount of light. The lights cast an attractive star pattern on the ground around them, which we thought was a nice touch in the design. We also liked the fact that the manufacturer backs up this product with a 100-percent satisfaction guarantee. These lights are best for seniors who may have poor eyesight, but only need a little bit of help seeing the edge of a pathway or step. The light isn’t as bright as other options, but it will help illuminate the ground closest to it. Furthermore, this is a good option for those looking for a low-maintenance option that’s easy to set up, since all you need to do is stick the lights in the ground and wait for the sun to charge them throughout the day. Note that seniors may need help installing these lights if they have trouble bending low to the ground. Though low voltage, they provide bright light for a doorway or walkway. It comes with the wires and connectors. The glow from the lights is warm and bright. They are easy to assemble. The bulbs will need to be changed. The plastic material won’t last like other materials. The Paradise GL22627 Low Voltage Plastic 4W Path Light is an attractive set with a black finish. Despite the low voltage, they cast a brighter light than many other options at 20 lumens. The lights include connectors for setting them up with any existing path lighting. You will, however, need to purchase the transformer separately. The light is pleasant, though they are not LEDs and won’t last as long. Therefore, the bulbs will need to be replaced. This could be fine for seniors who have caregivers who help them, or for those who still have the mobility to bend down and change the lightbulbs. However, if you’re aging in place independently and may not have the chance to change the lightbulbs as often as needed, these lights may not be the best option for you. These lights are made of plastic, which isn’t as durable as other materials. However, they are designed to be weather resistant so they’ll still shine through rain and snow. We liked the fact that you can opt for either four or six of them, depending on how large of an area you’d like to illuminate. 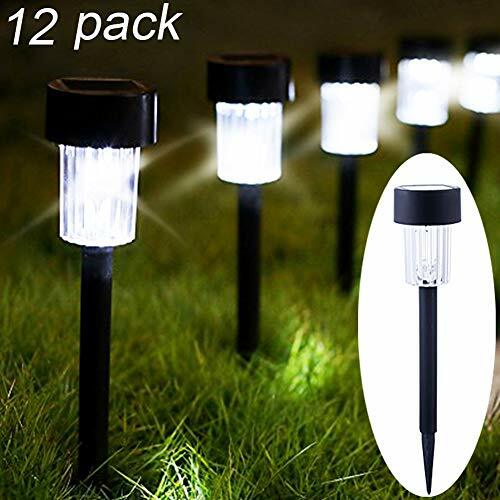 These garden lights are a decent value for the price. You get a lot of lights for the money. They are not obtrusive and fit in well. They’re a bit short at only 13.5 inches high. Plastic material might wear easily. 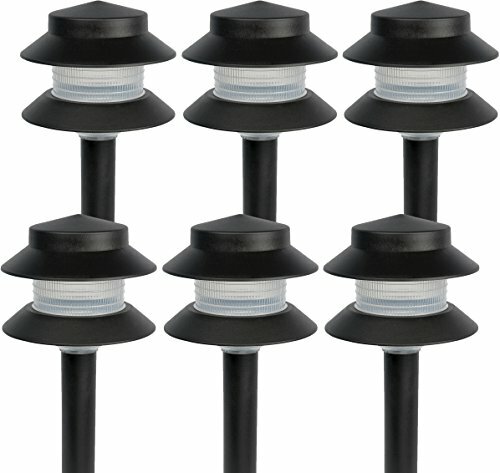 The Maggift 12 Pack Solar Pathway Lights Solar Garden Lights are plastic, like the previous product. They are also black but have LEDs instead of incandescent bulbs. The illumination is a cool white and only 2 lumens. However, you can still get enough visibility with the amount that you get. The design is simple and tasteful, making them a pleasing addition to your garden. We chose these lights as the best for the garden because of the ability to cluster them wherever you’d like. Since they’re solar, they can be placed in the ground where needed. Therefore, if you have areas of your garden that you’d like to have illuminated at night, these lights can be clustered accordingly to make certain areas brighter than others. This can also be beneficial for senior safety, making areas like steps and seating more visible in the dark. The value of this product comes from the fact that you get so many—and all the same style. The lights function like comparable solar products with the equivalent charging and working times. They are affordably priced too. They are plastic, but the design is good-looking. They blend in well with the surrounding area. On the downside, they aren’t as tall as others we’ve seen, which is a drawback. They offer an excellent way to keep you safe when climbing stairs. WIDE USE: Sleek, simple and rainproof design; They can used on deck steps, porch stairs, fences, walls, pathways, etc.. They come with a 100-percent satisfaction guarantee. It provides nine hours of light when fully charged. You can attach them to your stairway for a permanent solution. There are the occasional quality control issues. 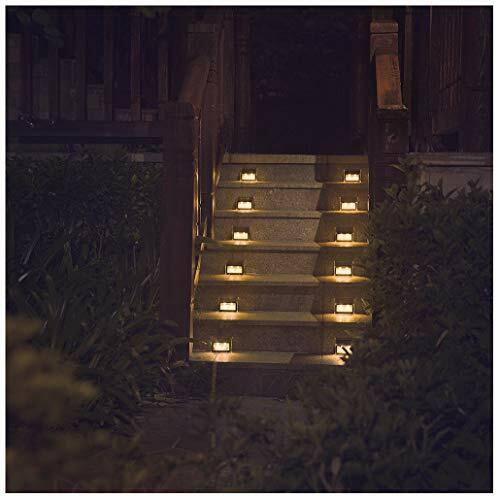 The XLUX Solar Lights are an ideal solution for illuminating a stairway to keep seniors from falling. The six lights will provide a warm glow that is bright enough for you to see where you’re going. They are well-made from stainless steel, so they’re built to last outside. They also snap to assemble, so they’re fairly easily for a senior to install on their own, and you can even install them permanently into your stairs. This is a very important edition for seniors aging in place in a home that has any stairs outside. Even if you have great sight now, it’s an important physical characteristic to pay attention to over the years. Something as simple as permanent lights are a great purchase to make well ahead of time, so when the time does come that your eyesight isn’t that great, you can rest assured that you’re less likely to experience an accident on your stairs. We also loved the way they look and the elegance they brought to our yard. We’d be remiss if we didn’t mention the excellent customer service the company provides. They offer 24/7 support and a one-year warranty on the product. They go well beyond our expectations for service which was a pleasant surprise. These lights are a festive addition to your yard. 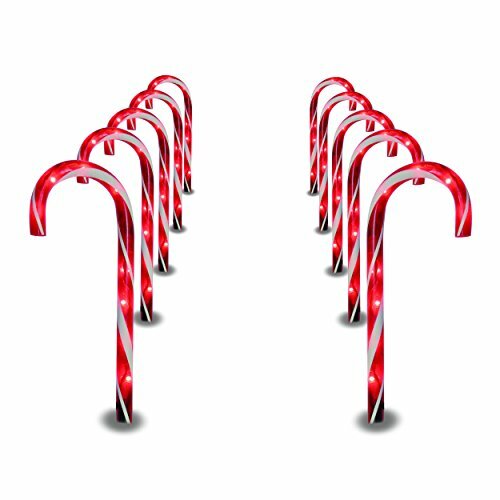 You get 10 candy cane pathway markers- Each candy cane has 6 bulbs and is 22" tall for a total lighted length of approximately 18 feet! The taller height will keep them visible during the winter even if it snows a lot. They give off a bright light. The light is distributed along their entire length with the bulb arrangement. The package includes spare bulbs which we appreciated. They’re temporary and seasonal lights. The Prextex Christmas Candy Cane Pathway Markers will add a festive touch to your yard for the holidays, and grandkids or other family members are sure to love them. You can install them as path lighting or hang them inside to illuminate dark spots in your home in a decorative manner. They come in two sets of five each. They are corded, so you’ll need to be careful about where you place them to avoid a fall hazard. These lights are a bit pricey, but they should be used as temporary lighting, so they will most likely last for many seasons. The light is decent, and they are weather-resistant to hold up against the elements. They are tall enough to remain visible during the winter, even if it snows, as each strand is about 9 feet long when extended. The bulbs are incandescent instead of LEDs. However, the distribution of light is pleasing and creates a warm effect. These lights are specifically for the holidays and shouldn’t be used year-round to increase visibility. Instead, we love them as a fun option to temporarily replace your usual path lighting during the winter months. These lights also may not be suitable for those who have very poor eyesight, as they do not shine as bright as other options, but for those who only need slight illumination, they’re sure to aid in finding your way in a festive and pleasing way. Now that you have an idea about your options, let’s delve into the topic further with some tips and information about making the best pathway lighting choice to increase visibility, prevent accidents, and add a welcoming feeling to your home’s outdoors. When searching for outdoor lighting, you’ll find items that use electricity, batteries, or solar power. With electricity, the advantage is reliability. You can set electric lights up so that a flip of the switch illuminates your walkway, or they can be set up on a timer. This is the best option for seniors who know they have poor eyesight and will need lights to illuminate their walkways or stairs every night. Battery-powered or solar lighting can be less reliable and could leave a senior inconveniently without lighting at any given moment. Therefore, electric lights give you an added benefit of safety, as long as you can ensure that the cord attached to the lights are out of the way and won’t cause any trips. Battery-powered products offer a convenient and often economical solution. Path lighting with lithium batteries also last longer than you may think, too, so they’re a great option if you’re comfortable with having to change the batteries from time to time. To get the most value out of them, you’ll need to keep spares at home. Finally, many people think that solar is the only way to go. With solar-powered bulbs, you don’t need to fuss with changing batteries or bother with having extras, and you also don’t need to bother with the cords or switches that come with electrical lighting. However, these lights have one glaring disadvantage. If you live north of the 37th parallel, you’ll likely find that the amount and angle of sunlight diminish significantly during the fall and winter, and these lights won’t work as well during rainy or overcast days. Therefore, these may not be the best option for seniors with very poor eyesight or who need to rely on lights to enter their home at night. You’ll find products with either LEDs or incandescent bulbs. The advantage with the former is that they’ll last longer. However, we also consider the temperature of the light. Incandescent bulbs will usually provide a warmer glow that adds to the environment, while LED lights tend to be brighter and better for visibility. We recommend LED lights for seniors with poor eyesight since they tend to be brighter, though incandescent lights might be sufficient and more attractive. Path lighting options are available for both inside and outside of your home, although some versions are only available for outdoor use, such as solar lights and those with stakes. They offer the same advantage in the different settings. Think about where there are dark spots that would benefit from some light. If you or a loved one wake up frequently during the night, consider placing them at potential hazards like stairways. If energy usage is a concern, opt for walkway lighting that has motion sensors. You’ll find path lighting sold individually or in sets. The advantage with the former is that you can get as many as you need without paying for ones that you won’t use. However, if they are one-off items, you may not be to get a matching group. We strongly urge you to pay attention to the design and construction of the lights whichever one you buy. If you’re placing them outside, be sure that they are sturdy and able to withstand the weight of snow cover if that’s an issue where you live. Also, you’ll need to remove snow from the solar panels if you’ve purchased this type. Be sure to put them someplace where it’s easy for you to clean them as necessary. Don’t be afraid to spend a little more for path lighting, primarily if you will use them a lot. With the seasonal nature of retail, you may find it difficult to replace broken ones at some times of the year. Finally, test out the lights after you’ve installed them. Make sure they’re bright enough to offer some value. Always keep your receipt and don’t be shy about returning them if they aren’t working as you expect. When it comes to your safety, you shouldn’t settle for a light that isn’t bright enough for your needs. One of the best ways to avoid falls is making it easier to see where you’re going. Illuminating stairs and walkways is an excellent start. And as you’ve seen, you have plenty of options for taking this simple step to a safer home and yard for both you and visitors.